This year marks the 40th anniversary of the closure of Liverpool Exchange and the opening of the Merseyrail Loop and Link underground lines. To commemorate this event we will be running a special bus tour on Sunday 2nd April. We will depart at 10am from London Street, Southport (near the side entrance of the railway station), and follow the routes towards Liverpool that the 502 units used, with diversions and pauses at other interesting historic infrastructure. We pause at Liverpool Exchange for a walk around the old station area, then continue to the Museum of Liverpool at Mann Island for a lunch break and a look at the restored Liverpool Overhead Railway coach. 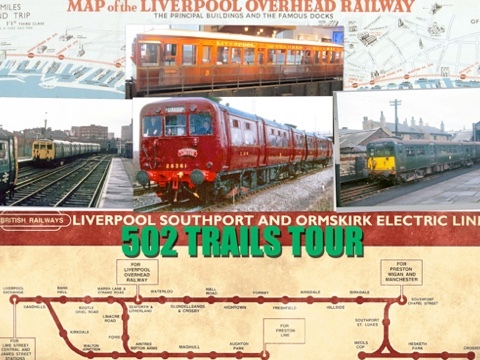 On our return journey to Southport we will follow part of the Liverpool Overhead Railway route into Bootle, then follow the North Mersey route to Aintree. Finally, we will head off via Maghull and Ormskirk to our base at Burscough, where the preserved 502 will be open to inspect the latest work. The fare payable on the day is £10. Please contact our treasurer, Tony Kuivala, to book your place. Email treasurer@class502.org.uk.